Otitis externa is an inflammatory or infective condition of the external ear canal. This can lead to excruciating pain, swelling of the ear canal and also decreased hearing due to obstruction. It is important to examine the ear carefully and then to clean out any debris or infective component using the microscope in the outpatient setting. Occasionally it is necessary to splint the ear canal open with a small temporary dressing. It is imperative that the ear is kept dry and no water is allowed into the ear canal. It is also imperative not to use any cotton bud’s or similar implements to scratch the ear canal as this will worsen the situation. 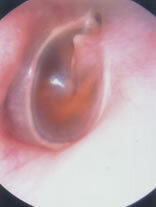 A grommet is a ventilation tube placed carefully in the eardrum in order to maintain appropriate middle ear pressures. As a result it is an excellent form of treatment for troublesome non resolving glue ear or recurrent acute otitis media. It is one of the commonest procedures performed in ENT on children. Typically it is performed under a general anaesthetic but occasionally can be undertaken under local anaesthetic in adults. It is usually a straightforward procedure but occasionally is complicated by early extrusion of the grommet, infections or residual perforation. 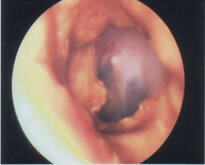 This is an operation designed to seal a perforated eardrum. The operation is usually undertaken to help or prevent recurrent infection and although it may improve the level of hearing this is difficult to guarantee. Typically a graft of fascia, overlying muscle close to the ear is taken to seal the hole in the eardrum. The ear is dressed for 1-2 weeks and this is removed in the out patient clinic. There is a risk of failure and this is related to patient factors, size of the perforation, site of the perforation and infections. This is an operation occasionally combined with a myringoplasty or occasionally performed for specific otological conditions (Chronic suppurative otitis media). The mastoid is the bone immediately behind the ear and is typically filled with air cells. This is entered surgically in this operation in order to improve ventilation of the middle ear or to exteriorize disease in the middle ear. Patients will have a head dressing overnight and often a dressing in the ear to stay for between 2-4 weeks. This deeper dressing is removed in the outpatients department. Prominent or ‘bat’ ears are a cosmetic anomaly that can affect children’s self confidence. An otoplasty is a cosmetic operation aimed at correcting this anomaly and requires a simple operation to reshape the position of the pinna. Postoperatively the child wears a firm bandage on the head to protect the position of the ears for 1 week and on removal will still require with support at nights with a simple headband for 2 more weeks. A septoplasty is an operation aimed at straightening the midline cartilage in the nose with the aim of improving airflow through the nasal airway. It is performed under general anaesthesia and occasionally requires a dressing in the nose for < 24 hours postoperatively. Patients often feel nasal blockage for 1 week after the operation which associated with the normal postoperative intranasal swelling. The natural route of drainage of the nasal sinuses is through the lateral wall of the nose. If there is an obstruction to this then patients develop symptoms of sinusitis (facial pain, fever, nasal discharge etc). FESS is an approach surgically using endoscopes in the nose to open the natural drainage pathways of the nasal sinuses and therefore release the pressure caused by sinusitis. The surgical approach is guided by a preoperative CT scan that shows the extent of disease and also the important structures that should be avoided during the operation. Polyps are swollen lining of the sinuses that protrude causing nasal obstruction to an individual. These are well treated medically and surgically. If symptoms persist after medical treatment then a surgical approach using endoscopes through the nose can offer great relief of symptoms to the patient. Often patients have a dressing in the nose for < 24 hours and may initially still feel blocked for the first few days. Spotting of blood for the first week is not uncommon. The turbinates are the fleshy tissues in the nose that warm, filter and humidify the air we breath in. Occasionally these are enlarged and as a result can cause symptoms of nasal obstruction. Medical treatment can be tried, but if this fails a surgical reduction of the turbinates may be undertaken. This aims to decrease the surface area of obstruction and therefore improve the nasal airflow. Recurrent tonsillitis, quinsy, obstructive sleep patterns in children are all indications to remove the tonsils in the form of a tonsillectomy. This procedure is performed under general anaesthetic. Post-operatively patients require regular analgesia and are required to ensure to continue eating and drinking to speed up their post-operative recovery. A large adenoid pad at the back of the nose can lead to both nasal and ear related problems. Surgical removal of this is referred to as an adenoidectomy. 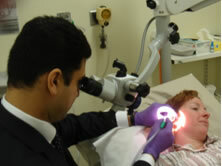 This is typically not a painful procedure alone but may typically be combined with a number of other ENT procedures e.g. tonsillectomy, grommet insertion. Snoring can be a complex complaint and there are both surgical and medical aspects to be thought about when managing patients with the condition. Snoring may be associated with an obstructive pattern of breathing (Obstructive sleep apnea-OSA), which can be detrimental to a patients cardiovascular system if untreated. It is for this reason that occasionally sleep studies are undertaken to assess for this in a patients sleep pattern. Mandibular advancement prosthesis can also be of use in some circumstances to help with snoring. Surgery can be contemplated with simple snoring and may be performed using a number of different modalities of surgical intervention (laser, diathermy, somnoplasty). All do similar things which ultimately stiffen the soft palate in an aim to decrease the snoring in a patient. Often the tonsils are removed at the same time opening the the back of the throat and therefore the upper airway. This is a painful procedure and patients will require strong analgesia for at least ten days post operatively. These procedures are aimed at visualizing the voicebox and the upper oesophagus. They are performed under a general anaesthetic and special metallic scopes are used to provide wide access to view these areas. Magnification with a microscope can be used to improve the view. Typically patients will wake up with a sore throat and rarely this procedure is associated with dental injury. The thyroid gland sits in the midline of the neck. It produces hormones that affect the metabolism of the body. Occasionally with overgrowth of the thyroid gland or unclear diagnoses of a mass in the thyroid it is necessary to undertake a removal of half or all of the thyroid gland. This is performed using a low neck incision, where possible placed in a skin crease for the best cosmetic result. The gland is removed whilst identifying and preserving important nerves nameley the recurrent laryngeal nerve that supplies the voicebox. Injury to this nerve can result in a hoarse voice. If all the thyroid is required to be removed this will render the patient hypothyroid (underactive thyroid function). In this circumstance the patient will require supplementation with thyroid hormone. In addition if all the thyroid is removed there is a chance that the glands related to calcium (a salt in the body) metabolism can be removed too. If this occurs calcium supplementation may also be required. Occasionally persistent gland enlargement in the neck warrants an excision of this gland (node). 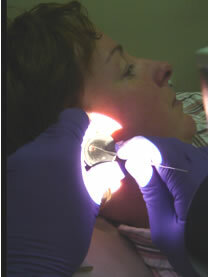 This can be performed using a small incision in the neck, identifying the node and removing it. Occasionally more than one node is removed and this is referred to as a selective neck dissection (see below). This is an operation used to clear a group of lymph nodes in the neck. Most often it is used when dealing with malignant pathology in the neck but sometimes is used as an adjunct to removal of some benign pathology. Depending on which groups of glands are to be removed there are various nerves and blood vessels close to the operating field that your surgeon will inform you about prior to the operation.